A FOLLOW-UP TOWN HALL MEETING WITH CONGRESSIONAL STAFFERS AND MEMBERS OF THE VILLAGES GROUP. The RA team and the Friends Committee on National Legislation meet with House Minority Leader Nancy Pelosi's staff in the Capitol Building. From June 22 - 26, Rebuilding Alliance travelled to Washington D.C. with a representative of Jewish Voice for Peace and an Israeli Professor to ask our elected representatives to stand for peace and stand against the demolition of Susiya. We followed up from your calls and letters to congress (more information below), and met with 27 offices to ask them to make calls to the State Department and the Israeli Embassy to express concern. 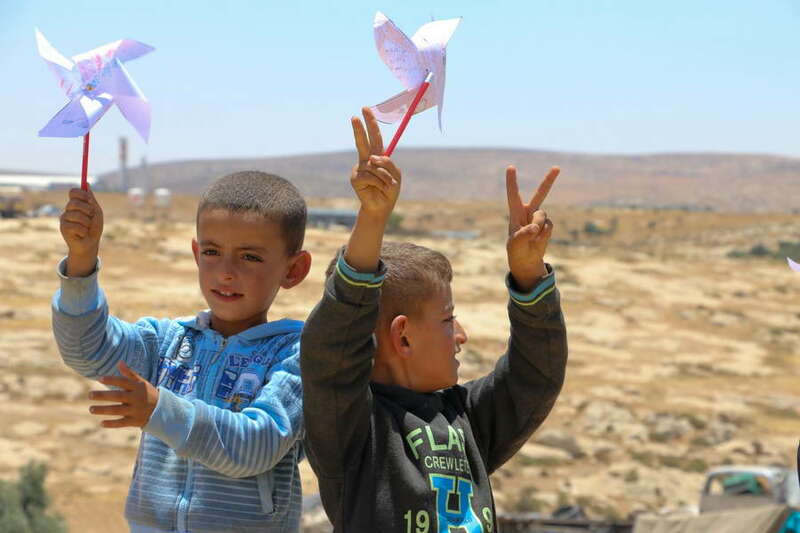 Thankfully, Susiya is still standing. To make sure the 340 men, women and children of this small village in the South Hebron Hills stay safe, we are hosting a Stay Human Conference Call on Wednesday, July 8, with senior congressional staffers, concerned constituents, and peace activists in the field. Register for the call now by clicking here. Dr. Ophir Mintz-Manor is an Israeli peace activist and a scholar of early Judaism and Christianity. Mintz-Manor (born 1973) grew up in a Kibbutz south of Tel Aviv and for the last twenty years has lived in Jerusalem with his wife and two children. After serving in the Israeli army for three years he started his studies at the Hebrew University of Jerusalem and received his Ph.D. in 2006. After spending two years in Brown University and the University of Pennsylvania he returned to Israel and was appointed a Senior Lecturer at the Open University of Israel. Throughout, Mintz-Manor was actively involved in many campaigns and organizations that promote democratic and human values in Israel and Palestine. For the past seven years Mintz-Manor has volunteered with the Villages Group, group of Israelis who visit regularly the small, rural communities of the South Mount Hebron Hills. The group works in partnership with local leaders and seeks to empower the communities in their daily, Sisyphean struggle to remain on the land they own. Mr. Hamed Qawasmeh is a member of the Villages Group and represents the Hebron and Bethlehem Governorates for the UN’s Office of the Higher Commissioner for Human Rights. Born in Kuwait and raised in the Persian Gulf, he moved to the United States to continue his education, finished his BA in Mathematics and MA in Political Science, then moved back to Palestine in 1997, and received a 2nd Masters in International Business Administration at Bar Ilan University. Before joining the UNHCR four and a half years ago, he worked with the UN’s Office for the Coordination of Humanitarian Affairs (OCHA). He also runs an all-volunteer organization called the Hebron International Resources Network (HIRN)) that works closely with the most vulnerable communities in the Hebron and Bethlehem Governorates. Moderator: Donna Baranski-Walker, the founder and Executive Director of Rebuilding Alliance, will be moderating this call. Donna is an MIT engineer whose work at Rebuilding Alliance focuses on rebuilding war-torn communities and working to bring the world together to make them safe. Breaking News: Rebuilding Alliance just received word our Rebuilding to Remain program in Al Aqaba Village is a semi-finalist for the World Habitat Award. Al Aqaba Village is our model for successful Congressional engagement to keep Palestinian villages standing. Rebuilding Alliance built the kindergarten there and recently completed construction of three affordable homes, the first of 30. On May 4 2015, Israel’s High Court of Justice ruled to allow the Israeli army to demolish the Palestinian Village of Susiya and expel the 340 men, women and children from the land they own. Demolition can happen even before the High Court hears the village's appeal on Aug. 3rd. Villagers, peace-makers, and diplomats are on high alert. The Palestinian village of Susya in the West Bank is an ancient historic village. Its residents lived in ancient caves for decades before the Israeli occupation of the West Bank. 30 years ago the IDF evicted the village residents in favor of an archaeological site and expropriated their land, forcing the residents to move to their nearby agricultural land and live in caves without electricity or running water. Now, the homes, schools, and buildings in Susya are under threat of demolition because the Israeli Civil Administration (ICA) considers them to be "unauthorized construction." However, all of the Susya residents’ attempts over the years to obtain building permits through the Israeli Civil Administration were rejected by the army. Because Susya is in Area C, planning and construction are administered by the Israeli Army and ICA. Building permits are almost systematically denied to Palestinians living in Area C.
A previous solution was to file master plans to the Israeli Civil Administration for approval, thus allowing building permits to be issued. Normally the filing of master plans puts a temporary freeze on demolition orders while the plans are under review. The residents raised large amounts of money, hired experts and submitted outline plans to the army. The plans were rejected. The State raised no security arguments nor did it argue against the petitioners’ ownership of their land. There are no good reasons to deny the master plans and building permit applications other than fore solely political purposes. The residents petitioned the Israeli High Court of Justice against the rejection of the plan and requested an interim order to freeze demolitions until the petition was heard. Expulsion of the village residents would be a grave breach international law. The High Court of Justice refused to grant an interim order. This means the army can destroy the village at any moment. Destruction of the village would create a severe humanitarian crisis. 340 people, including 140 children, would be thrown out into the desert without any social or public network to absorb them. Evicting the residents from their agricultural land will facilitate the settlers’ takeover of their land, as already happened on about 400 dunams of agricultural land surrounding the Jewish settlement of Susiya. The danger of demolishing and expropriating the village of Susya reflects the systemic problem of planning for Palestinian villages located in Area C; in these villages, planning is done by military planning committees, without representation of Palestinians, with the intent of preventing residents from building on their own land based on reasonable and professional planning standards. A recent High Court petition, submitted by the village council Dirat, Rabbis for Human Rights, Jerusalem Legal Aid and Human Rights Society, the Israeli Committee Against House Demolitions, and St. Yves – Catholic Human Rights Center, demands planning authority be returned to Palestinian villages for their own communities in order to prevent the tragic demolitions of hundreds of homes every year due to the impossibility of obtaining building permits.